Judge Vincent Gaughan did not characterize Van Dyke’s decision to open fire, saying only that it changed both McDonald’s and Van Dyke’s families forever. “That’s shame,” he said. You can see the pain … on both families … This is not easy.” He also said he knew the sentence would not please anyone. Because Illinois judges are typically required to sentence defendants for the most serious crime of which they are convicted, attorneys made arguments about the severity of the offenses, as governed by the state’s complex guidelines. Judge Vincent Gaughan’s decision on that point will help determine the sentence. 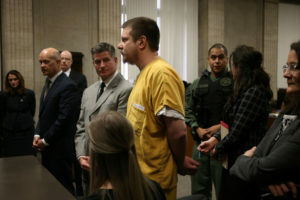 The defense wants Van Dyke, 40, to be sentenced primarily for the second-degree murder charge, partly because it carries a shorter mandatory minimum prison term of four years. Prosecutors want the judge to focus on the 16 aggravated battery counts because each one carries a mandatory minimum prison term of six years, and sentences for each count may have to be served consecutively instead of at the same time.